"This is a no roll, press in the pan crust, made with oil instead of shortening. It is very good and very easy. A good choice for when a top crust isn't necessary. Vegetable oil may be used instead of peanut oil." Mix all ingredients together in a bowl. Place dough in the pie pan, and press it out evenly with your fingers. Fill with favorite pie filling and bake. 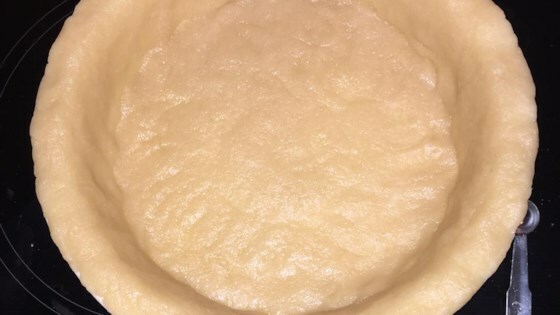 Watch how to make this easy, can’t-fail pie crust recipe. Disappointing; oily and tough. I would not make this again. I will never make a pie crust with unhealthy shortening again. I use canola oil for a heart-healthier crust. Roll this between two sheets of waxed paper. Couldn't be easier.